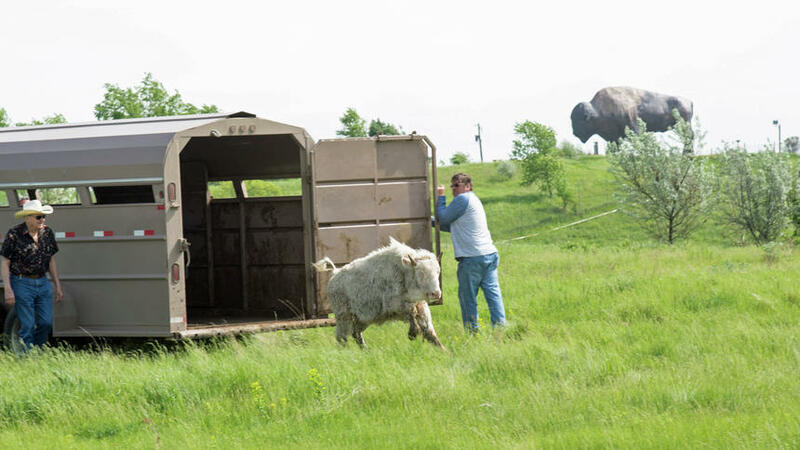 “She got out of there (the trailer in which she was transported) so fast, it was like a shot,” said Ilana Xinos, National Buffalo Museum executive director. Xinos said the museum is trying the year-old bison cow out on a trial basis with the herd. “We’ll see how things go, sometimes it takes a little time for the herd to adjust to a new face,” she said. Xinos said the North Dakota Buffalo Foundation, the nonprofit organization that founded and operates the National Buffalo Museum, has a committee that reviews any animals being considered for inclusion in the bison herd. When the white bison was born last year, the committee had been talking with Shirek Buffalo Ranch officials about adding the white bison cow to the herd. The North Dakota Buffalo Foundation Board of Directors decided in May to bring the cow here, at least for a trial basis. White Cloud became a Jamestown and North Dakota icon as White Cloud lived for almost 20 years as part of the museum’s bison herd. An albino, White Cloud bore another white bison calf, a son who was named Dakota Miracle through a contest. Dakota Miracle is still a part of the museum’s herd. Xinos said having white bison with the herd sparks people’s interest in bison as a whole. Xinos said the North Dakota Buffalo Foundation is working with the North American Bison Registry, which is part of the National Bison Association, to find answers to the question about rarity of white or albino bison. Albinism is the partial or complete lack of pigment in the skin, hair and or eyes. Leucism is the partial or complete lack of pigment in hair, skin or cuticles, according to information from mothernaturenetwork.com. Xinos said the museum’s bison herd will be participating in a study called the Great American Bison Diet. She said around 40 bison herds will send stool samples to the North American Bison Registry. Those stool samples will be analyzed and the specific types of forage and grasses the bison eat will be determined. She said the National Buffalo Museum’s herd could be termed “grass fed” as the bison mainly eat pasture. “When the pasture gets low in the winter, we feed them hay,” she said. Xinos said the museum would also like to start building a DNA database of the herd as a way getting visitors to the museum interested in more than just coming to the museum to look at the displays. “We want to get people thinking about the grasses the bison eat and about the prairie on which the grasses grow,” she said.